For six years, one of my projects in The United Methodist Church has been to free our doctrine, polity, and social statements from their paywalls. Recently, the project took two steps forward…and one step back. A bit under six years ago, I helped edit legislation to the 2012 General Conference which required the United Methodist Publishing House to offer digital versions of the Book of Discipline online for free. I believe our polity, beliefs, and our statements do more good when more people can read and distribute them. The 2012 GC accepted the legislation, but struck out the single word “free.” So since ~2013, a digital version of the Book of Discipline has been available for eReaders…but at cost. The secretary of the General Conference shall arrange for electronic access to all petitions, including General Conference action and the resulting impact on The Book of Discipline of The United Methodist Church, throughout the General Conference session. This access shall be available until the publication of the new edition of The Book of Discipline of The United Methodist Church. Implementation shall be according to guidelines established by the Committee on Plan of Organization and Rules of Order. 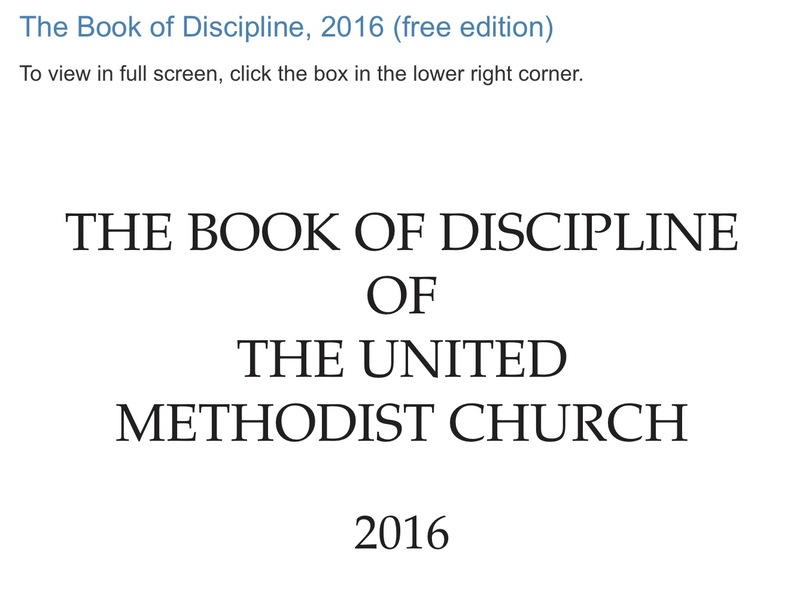 At the beginning of the third year of each quadrennium, the secretary shall arrange to make The Book of Discipline of the United Methodist Church available, free of charge in a keyword-searchable full-text digital format, on the official website of The United Methodist Church. So for 2 years, UMPH could sell the BoD and recoup the production cost. Then in the two years where free access to doctrine most mattered (the time when changing it would be proposed and debated), it would be freely available to everyone. Pretty decent, eh? Well, it was voted down at GC 2016. You can read the floor conversation here , starting on page 2471 with the free Book of Discipline being referred (meaning defeated) and the free Book of Resolutions referred as well. The Book of Discipline already exists online in the first year, and the Book of Resolutions will be available online when published in 2017. …Well, no. We aren’t arguing about whether to put them online–we already do that. We are arguing about whether to make it free. The debate continues to be “we already put it online and electronic copies” when the actual discussion is about making them FREE. But a joy was that they had not restricted the ability to download. So for at least 48 hours, the download link was available so people could download the PDF version which was searchable and full-text. That was the case until some jerk posted this option to the Facebook group UMClergy, of which the Publisher and UMPH/GBHEM employees and directors are members. Within 2 hours, the link was gone. The Work of the People? The work of thousands of common people, crafted not by experts but spur-of-the-moment edits and majority vote, has always been made into a product, placing the work of the people behind a paywall. Yes, less than $15 for a 900 page book is a bargain. But the text is still stuck behind a paywall, so it isn’t free to use and quote online. That’s the crux of it: copyright and DRM keeps our polity and resolutions from being freely searchable and shareable for usage or inspiration. Even if it was $1, the paywall would apply. Missions and ministry is digital now. When distant African towns get tablets instead of books, our doctrine must be digital and freely accessible. When digital text becomes searchable and exportable, it becomes translatable by free online tools, allowing local mission outreach and creative compilations of our work. Leading up to the closing of Cokesbury storefronts, UMPH has repeatedly missed opportunities to embrace the digital age, and it is hampering our missions. Freeing our doctrine, polity, confessional statements, resolutions, and our common work from the paywall will go a long way to redeeming that backwards tradition. What could a free Book of Discipline or Book of Resolutions do you for you in your context? I’m with you Jeremy. We need to do a better job of putting the Discipline in the hands of people and in the major language groups of the UMC. A “free” Book of Discipline is possible, but I think it will require us to use general apportionment dollars (rather than book sales) to pay for it. That will not come cheap, but it’s still worth doing. During the last GC (the first I’d seen live online) I went to our church library to check out a copy of the BoD. They were extremely outdated. Further, I rarely see pre-conference resolutions for Annual Conference let alone GC. I’m not clergy or paid staff. I don’t have the bucks to buy tons of documents and books, and when I do buy them I buy books I can use for the youth and young adult programs I lead. I can see no reason why the BoD and BoR should not be available FREE online. Those two in particular should be free to any church member. It is rare when we agree on ANYTHING Jeremy. But yeah, this should be available free and searchable. Isn’t it interesting to compare this to the work of UMPH regarding a new hymnal? Digital formats were emphasized as a part of how it would come to be published. It’s interesting to see how the BoD and BoR aren’t seen in this same light. Earlier in the transcripts, the total cost of publishing the BoD was put at around $900,000, ($1,600,000 if translated)… has anyone done the research on any varifiable loss of revenue due to posting the BoD as a .pdf? Do they even recoup all of their costs if they sell it at $15? Disclaimer: I’m old, (and VERY dyslexic,) and learning how to use new technology is difficult for me. I’ve expended admittedly more effort than would be necessary for most people on this plan. I was hoping that enabling our youth with access the BoD (what feels to many Liaty as “the man behind the curtain,”) to answer some of their many questions. I’m very disappointed to see now that it won’t work. Laura, the “jerk” who posted it was me. 😉 It was self-deprecating humor, sorry to make it obtuse! This is frustrating to me. It is like a citizen of the US being unable to freely get to the constitution or latest executive orders or legislative bills passed. This is one document that every single person who calls themselves United Methodist needs to be able to access without cost. Jeremy, thanks for this. I have always been perplexed why the Discipline was not free to the churches who enable and allow the Publishing House to exist. It would seem essential that every United Methodist church should have access to the official guiding document for the denomination. I would think that allowing every United Methodist congregation 1 copy would be a starting point for this. I agree with you, given that electronic media has become as pervasive as it is. The idea of a freely accessed document is not far fetched. Right there with you. And the ‘fully searchable’ part – that’s a must. I am curious… if the current ISSUU version were in searchable text format, would that be satisfactory to you? Also, I would invite you to go to the link below. It is the Google Books preview of the 2016 BOD and it has most of the pages (some are omitted, as is the case with most books on Google Books). You can search keywords on the left side and it will list the applicable pages and link you to the corresponding page(s) if they are available. While imperfect, I hope this is helpful to you. That’s helpful for others, thanks Brian. I have my own copy so I can use that offline. The problem comes with translation (you can’t select and export text from Google Books, near as I can tell) or for sharing specific sections with church members. Both the ISSUU and the GBooks versions treat the pages like an image rather than full-text, so that limits their usefulness as I indicated above in the penultimate section. I agree 100%. Beginning in 2006, I have long advocated for the Discipline, the Book of Worship and the Judicial Council decisions to be freely and readily available for all. I’m happy that the Book of Worship is finally accessible, even though the form in which it is offered is suboptimal. I still don’t know where to find Judicial Council decisions. And it isn’t even the whole Book of Worship…only the parts that we wrote or hold copyright to! Correct. Because you can’t permit others to publish what you don’t own. I’d pay $15 each for a downloadable and searchable PDF of both Books. I think the Church is failing to recognize the amount of interest there is (and income they’d receive) to move into a fully accessible digital format. It’s available in a searchable digital format. Just not free. Way to PREACH The Digital Gospel… perhaps using another recent innovation would be possible solution… to a method like gofundme.com or kickstarter.com orpledgemusic.com to recoup publication cost in advance from conferences or individual. I do think that the idea pay for it shelf life then free is very logical. But I suspect that the real issue isn’t publication cost that is hindering a FREE SEARCHABLE Version… the issue is the amount of lost revenue to Cokesbury, whose is already struggling. And As Amanda Palmer says in the “The Art of Asking: How I Learned to Stop Worrying and Let People Help” FREE is a hard to grasp concept for our capitalist paradigm. Great post. I would go one step further and say the BoD needs to be online, free and written in a way that is more accessible to most readers. The current writing and organization leaves a lot to be desired. There is so much good in our denomination that isn’t reaching people because we aren’t thinking of their needs. As others have noted, the problem goes beyond the BOD. A couple of years ago, when UM & Global was doing a review of Grace Upon Grace, the official, GC-approved theology of mission of the UMC, we ran into a similar problem. It turns out that UMPH owns the copyright. The book (which includes GC-approved text plus UMPH-generated study aids) is out of print and not even available on Amazon. We asked if we could put the GC-approved text only online in a free, public form and were turned down. Thus, our official denomination theology of mission is essentially unavailable unless you happen to live near a theological library because UMPH is worried about losing out on revenue on a book they are no longer actively publishing. Perhaps we need to consider who should own the BoD. I think it should be the property of General Conference. If that were the case, the General Administration Fund would pay the cost of putting it on line for free. While UMPH provides the staff for processing legislation, the costs are paid out of the General Administration Fund which comes from general church apportionments. Also, the costs of the Committee on Correlation and Editorial Revision are paid out of the General Administration Fund. Both the BoD and the BoR should be the property of General Conference. The conference would have the right to give UMPH the license to publish printed copies. I admit, I’ve been out of the loop a while (the most recent year in which I served as editor of the DCA was 2000), so this suggestion may not be applicable today. In a rare moment, I wholly agree with you Jeremy! Not only should the BoD be a fully searchable and FREE pdf, it should be released in all major digital formats for digital readers. I also advocate it become a free app that anyone can download that would make searching it, reading it, and sharing it much easier. I understand UMPH wants to be paid for their work, but doesn’t this text belong to the church (which is always its people) and not to UMPH? First thing Jeremy has posted that I fully agree with. As a PPR Chair I refer to the BoD frequently and screenshots are no fun. In fact, just went searching for it for a job description I didn’t have to copy on a copier, and found the ISSU version. Disgusting! I own a print copy, of course, but made great use of the PDF version because it was available digitally and could be easily distributed to officers. This, though, is more than frustrating. I have some information for you. I offer it from within my role as a member of the Committee on Correlation and Editorial Revision (part of the editorial team for the BOD and BOR) for this quadrennium. As you note, a free version of The Book of Discipline is available at Cokesbury.com, and it has been since 2011. 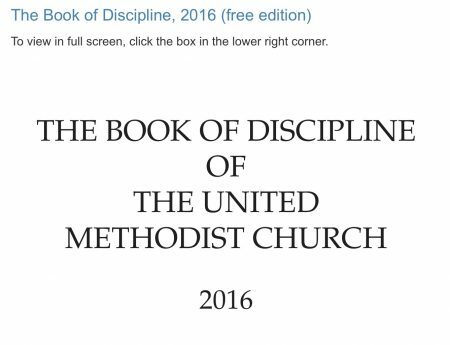 Additionally, in 2017, UMPH placed a 2016 Book of Discipline free at Cokesbury.com. It is located, as you posted above, at https://www.cokesbury.com/forms/DynamicContent.aspx?id=87&pageid=920. temporally available for downloads and the search functionality was turned off. Corrections are now under way, and searchability is expected to be restored within the next two weeks. I pray this finds you well. The fact that Amazon is “selling in the temple” for less than the official UMC channel has wonderful implications for the arguments about charging Methodists a premium price for their own governance document. I agree that a free on-line, searchable copy of the Book of Discipline should be available to anyone who wants/needs access. I’ve served in every major lay position in my small church in rural Virginia and presently am our delegate to our Virginia Annual Conference. Ready access to a current version of the Book of Discipline has been a chronic problem for my 30 years of membership. I’ve bought and donated a couple of copies along the way. At a minimum, the General Conference or each Annual Conference should resolve to send out a free printed copy of each new edition to every congregation. If necessary, reallocate resources spent on other publications to accomplish this obviously essential task. I wonder how many small, rural congregations don’t purchase copies of updated books because of the cost? Is it typically the clergyperson’s responsibility to see that they do? Or do clergypeople own the books which mean they still might be inaccessible to the lay members? My current church doesn’t have a copy of the BOW which for years I had been using at the other local Methodist church where they owned at least one and maybe as many as three copies. Then when I was preparing worship as a Lay Servant/Speaker I must have been using my pastor’s personal copy so after she left and I was asked to lead worship, there were no resources. I find the online version limited and hard to negotiate. It is NOT user-friendly. And I have an IT degree. I am not sure what year of Book of Discipline my church has since I have not needed to read it lately. I don’t know if I already chimed in on this, but I totally agree that the Book of Discipline should be free. It’s the way we’re supposed to be operating!! We have to PAY to know our rules? I’m a Sunday School teacher and a youth group supporter and a UMW officer. There are times I want to refer to the Book of Discipline but do I have to put it in our church budget to buy it every 4 years? Then I have to go to my church, hope that it’s left where it belongs and then use it there? It would be way more useful (i.e. it would be used) if it were free and digital. Totally agree! Hi, do you know where I can get a copy of the original book of discipline (1790 I think?) Just on online version would be great, but I’ll also buy a book if need be. Thanks so much. As a rather new Methodist this really concerns me and would have severely made me question joining the church. If, fundamentally, your core beliefs and practices are only available for a price then how are we different than Scientology or Mormonism? I know this sounds extreme at first, but I don’t think it is. Essentially I’m now being told that to know how my church works and gain ‘secret’ knowledge I need to pay? How can this possibly be reconciled with scriptures to ‘not hide our light’, ‘be a city on the hill’, and with a Jesus that calls all to him? If not for my local church experience, if I had known this before I joined the UMC, I would not be in the UMC as a member today. Frankly only cults don’t readily and freely provide the guidebook for how their churches operate. That the UMC doesn’t seem to understand this, and worse, wants to sell a product created through the resources and gifts of its members is troubling in the extreme. We recognize that it is immoral for the secular authorities to not provide public access to the law freely and openly. Are we truly less ethical than our government?